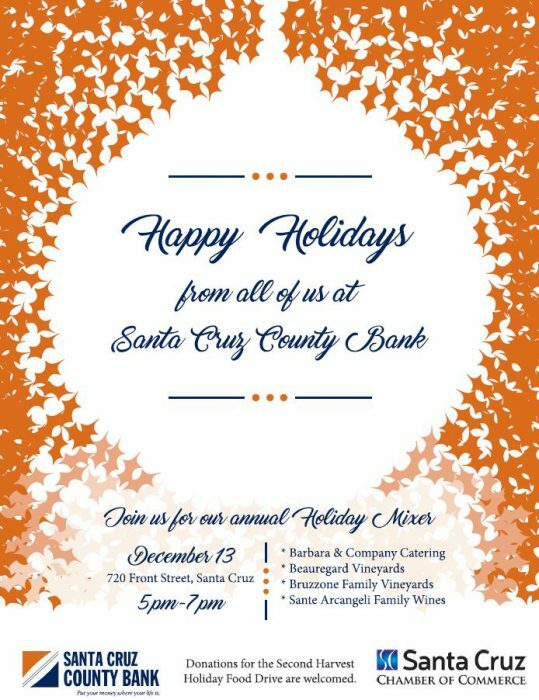 Join the Santa Cruz Chamber of Commerce for their Annual Holiday Networking Mixer held at Santa Cruz County Bank. Everyone is welcome to join in this celebration! Cost is $5 for SC Chamber members and $10 for non-members. Click the link below to prepay and register; tickets are also available at the door. Donations to Second Harvest Food Bank Holiday Food & Fund Drive welcome. Bring cash or checks or donate non-perishable food items. Special Guest Appearance by Santa Cruz Warriors Mascot, Mav’Riks!